This chart comparing business as usual to climate goals from the New York Times shows that all Paris pledges by 2030 will only cut annual world emissions by less than 10%. As such, Paris emission reduction pledges should be seen as no more than ‘icing on the cake’, with the body requiring carbon removal. The key numbers are roughly as follows. •	By 2100, humans will have added about 6000 gigatons of carbon dioxide to the air. •	By 2030, the Paris Accord if fully implemented will have reduced the total addition by 60 gigatons of CO2, about five gigatons per year. 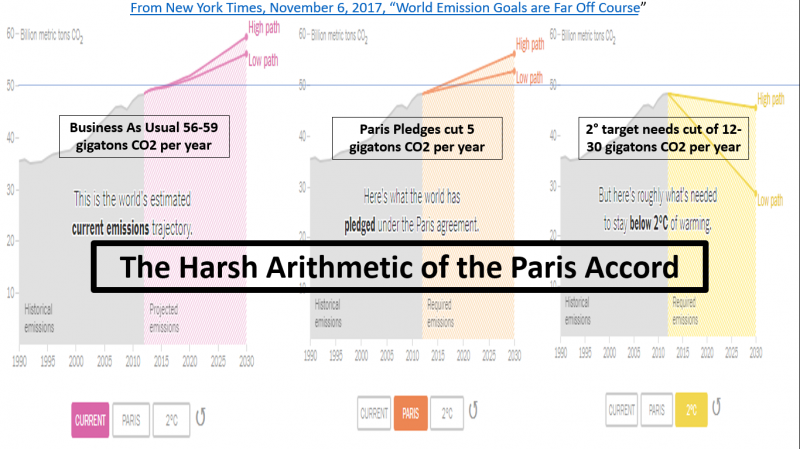 •	This Paris goal removes about 1% of the total carbon addition, and if continued at the same rate to 2100 would avoid addition of about 5% of the total added carbon. •	A result of 5% is marginal to the scale of the problem, creating high risks of dangerous tipping points. •	The difficult politics and precedents and trajectories around the Paris Accord indicate that even this marginal result could only be achieved with great difficulty. •	By contrast, Carbon Dioxide Removal technologies such as Iron Salt Aerosol or large scale ocean based algae production offer potential to remove 100% of the added carbon, at far lower unit cost and faster speed than any emission reduction methods. trillionthtonne.org at Oxford University that says with 3 degrees of warming there will be 5500 GT of CO2 (=1.5 GT carbon) by 2050. 6000 GT by 2100 is well within business as usual. Global CO2 emissions forecast to 2100 Figure 4 shows cumulative emissions reaching 6000 GT this century under all population scenarios. In assessing climate restoration, an important starting point is to be guided more by science than politics. Accepting current political opinions as binding constraints is a recipe for climate failure. This is particularly so in regard to the balance between emission reduction and carbon removal. This balance should first be assessed on a scientific basis, in order to work out if the prevailing assumption of the primacy of emission reduction is well grounded in evidence. If the unit cost through carbon dioxide removal technologies is orders of magnitude less than through emissions reduction, as appears the case, it is crazy and self-defeating to insist on emission reduction for purely political reasons. Gaining acceptance for climate restoration will only work with a viable scientific and political case. Climate restoration requires analysis of constraints and opportunities. The entire concept of climate restoration faces political and cultural blockages, both from defenders of the old economy and from proponents of emission reduction as the sole climate strategy. Sometimes the barriers are hidden, or activities which seem beneficial may prove unhelpful. The ability of the Paris Accord to realise its warming targets is impossible while it focuses on the marginal factor of emissions. A big question is the balance between carbon removal and emission reduction for achieving a healthy climate. The mathematics shows emission reduction is marginal, even though at present it is central to climate politics. Addressing constraints to implementation requires discussion about the political economy of climate restoration, identifying which groups are possible allies or opponents, how strong and influential are their views, resources, incentives and alliances, and what the implications of working with them might be for achieving the restoration goal. My analysis of the debate suggests the Paris Agreement is mired in confusion about how to reach the 1.5 target, or even the two degree target. UNEP November 2017 Emissions Gap Report says “current state pledges cover no more than a third of the emission reductions needed, creating a dangerous gap, which even growing momentum from non-state actors cannot close. This report highlights the dangers of that gap, the issues behind it and the means at our disposal to close it.” My reading is that this UNEP report fails in this objective of showing how to close the gap, largely ignoring the central need for a shift of policy to focus on R&D for oceanic carbon removal. The problem is that we cannot ‘close the gap’ by speeding up emission reduction, since neither the politics, the economics or the physics make that a feasible strategy. The UNFCCC meeting in Bonn in May 2017 appears to have failed to address any practical measures to reach the 1.5 target, with no sessions discussing carbon removal. There is no convincing rebuttal of the US government observations that all Paris commitments would have only marginal impact on temperature. In fact, the only thing that will cut temperature rise is taking out the excess carbon already in the air, but that is barely on the IPCC agenda. The statement that emission reduction could be marginal is an incentive for effective large-scale action in cooperation with industry. The key argument is about the moral hazard of carbon dioxide removal. The perceived hazard is that CDR on a scale comparable to total emissions would remove all political pressure and much ecological/climate need for emission reduction and would thereby serve fossil fuel interests. But why is that necessarily bad? The moral hazard opposition to carbon removal can be questioned for confusing means with ends. Emission reduction is not an end in itself, but only a means to achieve climate restoration. The goal of climate policy is a safe and stable climate, but the focus just on emission reduction can only achieve results that are too small to achieve that goal. By making the attack on the fossil fuel industry central, the climate lobby generates political opposition, as seen in Mr Trump, and also prevents focus on carbon removal. If fossil fuel industries could cooperate with carbon removal at scale, recognising that they are likely (BP Energy Outlook) to provide most energy for the next decades, we could get on a realistic path to solve the global warming problem. The contrasting reasoning, against the moral hazard arguments, is that cooperating with affected industries to identify practical ways to remove carbon at large scale could achieve far more than the 5GT per year of CO2 reduction planned under the Paris Accord. It is not easy to calculate the economics of CO2 removal. Apollo/Manhattan scale research to develop new innovative Carbon Dioxide Removal technology may even find that CDR can be profitable, with high economic return. My view is that the best methods of CO2 removal will prove to be around large scale ocean based algae production, building upon both NASA’s OMEGA project and the new refinement of Ocean Iron Fertilization using Iron Salt Aerosol to distribute iron at very low concentration via the troposphere, mimicking the principal ice age cooling agent of dust feedback. These methods could become profitable due to the potential for algae to provide commercial products such as food, feed, fish, fuel, fabric and fertilizer, and the benefits of a cooler ocean, including direct benefits for industries including insurance, shipping, tourism, fishing, finance and mining, who should all have a solid business investment case for safe and efficient carbon removal. The profit would then fund rapid expansion and refinement. The stumbling block, however, is the moral hazard argument mounted by the climate lobby, that such industry partnerships undermine emission reduction. Unfortunately, exclusive focus on emission reduction advocacy now looks like a ‘dog in the manger’, preventing innovative research and development of safe and profitable methods of climate restoration. The benefits of renewable energy for economic efficiency and a clean environment are massive and should be celebrated and expanded. However, these superb results have been oversold as a climate solution. If the Paris Accord results only in the removal of about 5GT of CO2 per year as projected by 2030, or even double that projection, clean energy will remain marginal to climate restoration, which requires a higher order of magnitude of carbon removal. We need immediate investment in carbon removal technology to prevent dangerous climate tipping points, especially in sensitive location such as the Arctic and the Great Barrier Reef. To make a banking analogy, carbon emissions have put the world heavily in debt, but the Paris Accord is not even paying back the interest, let alone the principal. We may pray that our debts should be forgiven, but the reality is that mortgagee repossession is looming quickly. And doubling down on emission reduction won’t work. A completely different strategy is needed, with carbon removal as the new paradigm for climate restoration. I give no value to IPCC review processes because I have seen little evidence of sincere engagement by governments with the need for carbon removal for climate restoration. The main driver of ascendancy for renewables is unfortunately the mass delusion that emission reduction could be decisive for climate restoration.